This sounds a lot like the experience I had with you at the IndieWebSummit where we got so engaged in talking and thinking while we walked back to the hotel one night that we easily got lost and walked twice as far as we needed to. I was doing some reading and thinking about how one might translate the idea of blogging into Latin. I tried entering “I am blogging.” into Google translate just to see what would come out. Perhaps it’s just a glitch in their translation algorithm, but the response felt apropos to me. Similar to several other mantras I’ve seen recently by various bloggers. Most of them have essentially said that they write to test out ideas, to stretch their thinking, to try to find additional clarity in what they’re contemplating. This takes a slightly different tack, but is roughly the same thesis. 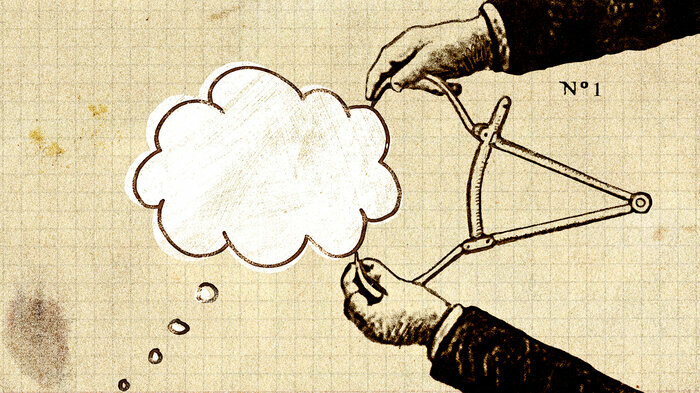 In "The Secret History of Thoughts," co-hosts Alix Spiegel and Lulu Miller ask the question, "Are my thoughts related to my inner wishes, do they reveal who I really am?" The answer can have profound consequences for your life. Hear the story of a man gripped by violent thoughts, and explore how various psychologists make sense of his experience. Also, meet a man trapped inside his head for 13 years with thoughts as his only companion. What an awesome little podcast Invisibilia is! Can’t wait to catch the rest of the episodes. Interesting to hear the quick overview of the three schools of thought on thought. I had been hearing commercials for this off and on from other podcasts for almost a year; glad I finally downloaded to listen. ‘ll be the first to admit that I’m a reading junkie, but unfortunately there isn’t (yet) a 12 step program to help me. I love reading lots of different types of things across an array of platforms (books, newspapers, magazines, computer, web, phone, tablet, apps) and topics (fiction/non-fiction and especially history, biography, economics, popular science, etc.). My biggest problem and one others surely face is time. At least twice a year I look at my reading consumption and work on how to improve it, all the while trying to maintain a level of quality and usefulness in what I’m consuming and why I’m consuming it. I continually subscribe to new and interesting sources. I close off subscriptions to old sources that I find uninteresting, repetitive (goodbye echo chamber), and those that are (or become) generally useless. I carefully monitor the huge volumes of junk email that end up in my inbox and trim down on the useless material that I never seem to read, so that I’ll have more time to focus on what is important. I’ve taken up listening to audiobooks to better utilize my time in the car while commuting. I’ve generally quit reading large swaths of social media for their general inability to uncover truly interesting sources. I’ve used some portions of social media to find other interesting people collating and curating areas I find interesting, but which I don’t have the time to read through everything myself. Why waste my time reading hundreds of articles, when I can rely on a small handful of people to read them and filter out the best of the best for myself? Twitter lists in particular are an awesome thing. I’ve given up on things like “listicles” or stories from internet click farm sources like BuzzFeed which can have some truly excellent linkbait-type headlines, but I always felt like I’ve completely wasted my time clicking through to them. About six months ago in the mountain of tech journalism I love reading, I ran across a site launch notice about a tech start-up called Spritz which promised a radically different solution for the other side of the coin relating to my reading problem: speeding the entire process up! Unfortunately, despite a few intriguing samples at the time (and some great details on the problem and their solution), they weren’t actually delivering a product. Well, all that seems to have changed in the past few weeks. I’ve waited somewhat patiently and occasionally checked back on their progress, but following a recent mention on Charlie Rose, and some serious digging around on the broader internet, I’ve found some worthwhile tools that have sprouted out of their efforts. Most importantly, Spritz itself now has a bookmarklet that seems to deliver on their promise of improving my reading speeds for online content. With the bookmarklet installed, one can go to almost any web article, click on the bookmarklet and then sit back and just read at almost any desired speed. Their technology uses a modified version of the 1970’s technology known as Rapid Serial Visual Presentation (RSVP) to speed up your reading ability, but does so in a way that is easier to effectuate with web and mobile technologies. Essentially they present words serially in the same position on your screen with an optimized center mass so that one’s eyes stay still while reading instead of doing the typical saccaddic eye movements which occur with typical reading – and slow the process down. Spritz for speed reading the web. As a biomedical engineer, I feel compelled to note the interesting physiologic phenomenon that if one sits in a rotatable chair and spins with one’s eyes closed and their fingers lightly placed on their eyelids, one will feel the eye’s saccades even though one isn’t actually seeing anything. Spritz also allows one to create an account and log in so that the service will remember your previously set reading speed. Their website does such a great job of explaining their concept, I’ll leave it to the reader to take a peek; but you may want to visit their bookmarklet page directly, as their own website didn’t seem to have a link to it initially. As a sample of how Spritz works on the web, OysterBooks is hosting a Spritz-able version of Stephen R. Covey’s book 7 Habits of Highly Effective People. Naturally, Spritz’s solution is not a catch-all for everything I’d like to read, but it covers an interesting subcategory that will make things useful and easier. Though trying to speed read journal articles, textbooks, and other technical literature isn’t the best idea in the world, Spritz will help me plow through more fiction and more leisurely types of magazine and online articles that are of general interest. I generally enjoy and appreciate these types of journalism and work, but just can’t always justify taking the time away from more academic pursuits to delve into them. Some will still require some further thought after-the-fact to really get their full value out of them, but at least I can cover the additional ground without wasting all the additional time to do so. I find I can easily double or triple my usual reading speed without any real loss of comprehension. In the last week or so since installing a my several new speed reading bookmarklets, I’ve begun using them almost religiously in my daily reading regimen. I’ll also note in passing that some studies suggest that this type of reading modality has helped those who face difficulties with dyslexia. Naturally, since this is a great idea, there’s a bit of competition in the speed reading arena. Clayton Morris has also developed an iOS application called ReadQuick, which is based on the same concept as Spritz, but is only available via app and not on web. Rich Jones has developed a program called OpenSpritz. His version is opensource and has an Android port for mobile. There’s also another similar bookmarklet called Squirt which also incorporates some nice UI tweaks and some of the technology from Readability as well. For those wishing to Spritz .pdf or .txt documents, one can upload them using Readsy which uses Spritz’s open API to allow these types of functionalities. There are also a variety of similar free apps in the Google Play store which follow the RSVP technology model. Those on the Amazon (or Kindle Fire/Android Platform) will appreciate the Balto App which utilizes RSVP and is not only one of the more fully functional apps in the space, but it also has the ability to unpack Kindle formatted books (i.e. deal with Amazon’s DRM) to allow speed reading Kindle books. While there is a free version, the $1.99 paid version is more than well worth the price for the additional perks. In addition to the handful of speed reading bookmarklets I’ve mentioned above, I’ve got over 50 bookmarklets in a folder on my web browser toolbar. I easily use about a dozen on a daily basis. Bookmarklets make my internet world much prettier, nicer, and cleaner with a range of simple clever code. Many are for URL shortening, sharing content to a variety of social networks quickly, but a large number of the ones I use are for reading-related tasks which I feel compelled to include here: web clippers for Evernote and OneNote, Evernote’s Clearly, Readability, Instapaper, Pocket, Mendeley (for reading journal articles), and GoodReads. Do you have a favorite speed reading application (or bookmarklet)? To establish a place of work where engineers can feel the joy of technical innovation, be aware of their mission to society, and work to their heart’s content. Explains the importance of thinking in daily life, discussing how to achieve focus, creativity, and a positive outlook in a technology-driven world. While some might categorize this as a “self-help” or “business” book, it’s really a broader reaching thesis which is perfect for almost any reader. It’s both a descriptive as well as prescriptive manual for the human thinking machine. Similar to his previous two excellent must-read books on civility (Choosing Civility: The Twenty-five Rules of Considerate Conduct and The Civility Solution: What to Do When People Are Rude), this is a well-written, clear, and concise text whose aim is the noble goal of improving all of our lives. In the vein of excellent recent books like William Powell’s Hamlet’s BlackBerry: Building a Good Life in the Digital Age, David Allen’s Getting Things Done: The Art of Stress-Free Productivity, Steven Covey’s The 7 Habits of Highly Effective People, and others, Dr. Forni covers the ground of how to best deal with the current “age of distraction” in which we live. Even better, however, he makes many of these books obsolete as he uses his phenomenal depth of knowledge of everything from the Greek and Roman schools of thought to Benjamin Franklin and George Washington and then through to Napoleon Hill (Think and Grow Rich) and Dale Carnegie (How To Win Friends and Influence People and How to Stop Worrying and Start Living)and beyond to provide simple and useful examples of how to be a better and clearer thinker and to elucidate how that will make your life a happier one. Fans of “Getting Things Done” (GTD) will appreciate some of the underlying philosophy, but will love how it extends those concepts to create a truer sense of happiness in their daily lives. When I initially approached the book–as an avowed addict of the fast-paced flow of information from both the internet and television–I was daunted at the mere ideas that the book portended. But again Dr. Forni breaks the proverbial mountain into a practical mole-hill. He divides things into simple and understandable chunks, but also provides the necessary motivation along with simple examples of how to carry out this wonderful philosophy. In the short time since I’ve read the book, I’ve been able to more easily put down my “crack-berry” smart-phone and focus more on what I’m doing and getting the best out of life. Fans of his previous work who have “chosen civility”, will also appreciate how he ties in the concepts of civility and further extends them to the concept of thoughtfulness. The same way he broke down the concept of being civil and created simple, executable ways of changing your daily behavior, he does so with thinking while simultaneously removing the implied modern-day stigma of being a “thinking” person. In short, this is the book that I wish I had been given before I started high school or even before I started college. I’ll desperately miss all the time I’ve had without this book, but I’ll definitely be living a better life now that it’s here. One thing is certain: everyone I care about will be getting a copy for the holidays this year!